Over in Kensal Rise, away from the hubbub of Central London, is a charming, unpretentious flower shop which has become the floral darling of the media world. Scarlet & Violet started life in Chamberlayne Road back in 2004. Vic Brotherson's plan was to run a small workshop, manageable for just one person, and to allow her to take a step back from the pressure of work. Just nine years later, the business has grown to have 7 full time florists, a driver and Vic's sister, Emma, as the office mastermind, and an enviable client list and media profile. So how did all that happen? "I left university with a degree in fine arts, and needed a job – any job – to earn some money. I stumbled into a position as a trainee florist at Wild at Heart at 21 years old, learnt on the job and stayed there for 15 years. "When I left in 2006 to open my own flower space, it was an extraordinary decision. My intention was to step away from the pressure and run a little flower business by myself." Vic puts the growth of her business down to the fact that she finds it difficult to say no! It transpires that Kensal Rise is packed with stylists. Vic could not refuse their requests for flowers for photoshoots, the stylists loved them and recommended Scarlet and Violet far and wide. Vic tends not to mention the names of her clients - the media do that for her! But it is no secret that Vic created the flowers for the wedding of Kate Moss. The shop is now busy all the time and opens six days a week. "The shop has to look beautiful every day, and we have to be able to offer something gorgeous for every budget, even if someone has only got a fiver to spend." Flower Market – Life without Limits! Vic turns to New Covent Garden Flower Market for all her flowers and foliage, other than branches brought in by clients from their personal cutting gardens, visiting every morning to spot what's looking particularly good. "I have never bought from a Dutch lorry, ever," says Vic. "I imagine life would be easier if I bought direct from Holland, but the flowers are too standard, just so average-looking." 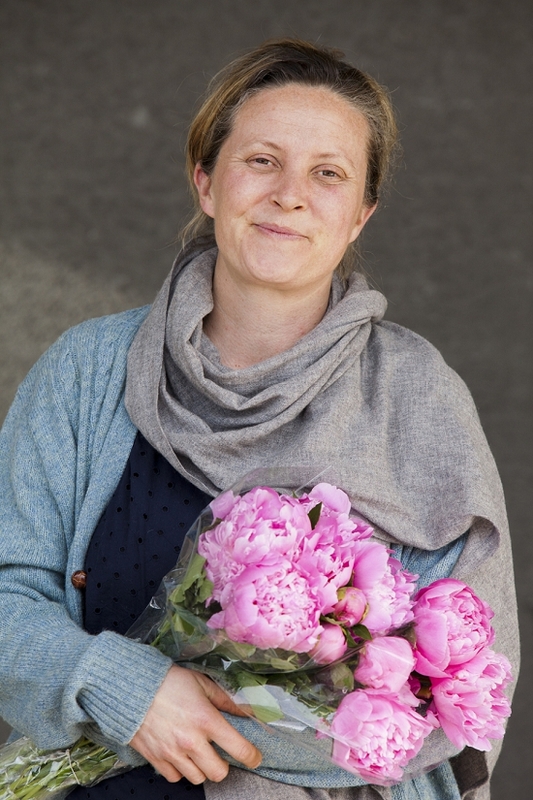 She buys on site at the Flower Market and never orders in advance – a practice that Vic admits can be tricky occasionally, but with 30 wholesalers to choose from is rarely a problem. "Why would I limit myself to a list of flowers, when I can see amazing stuff in Market?" asks Vic. Consequently, Vic seeks an open brief from event clients, pitching on a colour palette rather than a proscribed list of flowers. Vic has been buying at the Flower Market since she was just 21 years old, and has clearly established strong relationships with her wholesalers. She will buy from anyone in the Flower Market, with the flexibility to select the right flowers for the right jobs. Perhaps 60% of her annual spend is concentrated upon flower wholesalers Bloomfield, Dennis Edwards Flowers, DG Wholesale, Alagar and British foliage specialist GB Foliage. Her British flower favourites are Pratley, Zest and Goodchild. So what does Vic love about British flowers? "I love the freedom of British-grown flowers," says Vic. "Their shapes make for more interesting arrangements, much looser. I wish there were more British growers, though. Another huge plus for British flowers is the cost in peak growing season, which makes life more pleasurable. You can hand over a good sized bunch of British flowers to a customer for not too much money and they just look amazing." "Our busiest time is right now, from June to July, and at this time of year, the stock is pretty evenly split between English and Dutch." The look of a Scarlet and Violet arrangement is characteristically loose, soft and natural. Until British flowers come into their own in the summer months, Vic uses beautiful British foliage supplemented largely by imported flowers to achieve the look. And Vic's favourite British-grown flower? Today, it's the British peony. Read more here. How do you buy British flowers and foliage? And how do you buy at the Flower Market? Just pop your thoughts down in the box below. We would love to hear from you.